MAXXUM 2 contains iron and is ideal as a maintenance multi for individuals at risk of iron deficiency, including menstruating women. 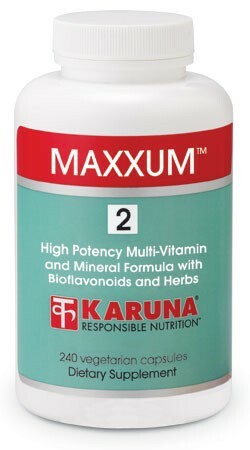 The unique MAXXUM 2 formulation includes practitioner-requested ingredients including digestive support from HCl and enzymes. Capsules are often preferred for their smaller size and quick dissolution. The formulation of this very popular supplement has been left in its original form at the request of health care professionals whose patients have used it with confidence over the years. Suggested use for adults: 4-8 capsules daily, taken with meals, or as directed.